A proverb scratched on a column in the peristyle of the House of M. Holconius Rufus (VIII.4.4) at Pompeii (Jashemski et al. 2002, 137). Looking for the evidence of millet, a generic term for a large group of small seeded-grasses, that includes both Setaria italia (L.) P. Beauv. and Panicum miliaceum L., used during the Roman empire, circa 753 BC–610 AD, presents a number of challenges. Millets are only mentioned a handful of times in the ancient surviving texts, there are only a few well-documented preserved archaeological finds of millet and limited scientific evidence, including archaeobotanical (ancient preserved plant remains) and isotopic evidence (based upon plants using either C3 and C4 photosynthesis). All these lines of evidence are problematic in terms of their representativeness but together they offer a more complete glimpse into the growing understanding of millet and its use and importance in the Roman world. In other plant taxa it may be problematic to attribute specific botanical species to ancient Greek and Latin names as it is difficult to trace the ancient version of the plant through to modern times. However, this is not the case with Panicum miliaceum or common millet as it has been recovered dating back to the end of the third millennium BC on European archaeological sites (Boivin et al. 2012; Dalby 2003, p. 99; Valamoti 2013) and Setaria italica (L.) P. Beauv or commonly known as Italian millet has been cultivated since the Bronze Age circa 2000 BC in Europe (Jashemski et al. 2002, p. 162). The wild progenitor or ancestor of foxtail millet, Setaria viridis (L.) P. Beauv, is well identified and shows clear morphological affinities with, and can interbreed with domesticated Setaria italica (L.) P. Beauv. (De Wet et al. 1979, p. 53; Zohary et al. 2012, p. 71). Millet is most commonly known in ancient times as being used for fodder to feed livestock and other domesticated animals including birds (see Figure 1). However, millet was also eaten by humans. Millet can be boiled and made into a porridge or ground into a flour and made into a heavy flat bread. The Romans probably did both with it. From the writing of the ancient Greek physician and author Philotimus, we know that one way of preparing millet involved being ‘pounded when raw, ground finely and, after some water has been poured on, it is pounded once again, strained, boiled’ (Oribasius I.15.2). Based upon the ancient texts it appears that millet was not the Romans’ favourite or first choice of flour for making bread with but it also wasn’t discarded by the Romans. For example, the presence of millet within the majority of properties with Insula VI.I and other elite houses within the city of Pompeii suggests that millet may have been consumed by the wealthy Roman owners and their servants and slaves. We now know that millets are rich in carbohydrates but poorer in digestible proteins than other cereals making it an excellent appetite satisfier to fend off hunger (Spurr 1986). Thus, common and Italian millet could have been used by the Romans in place of other cereal grains to make and/or bulk up breads and porridges, particularly in times of food shortages or crop failures in an to attempt to satisfy a starving stomach. Practically, millet filled a very useful place in the Roman diet. 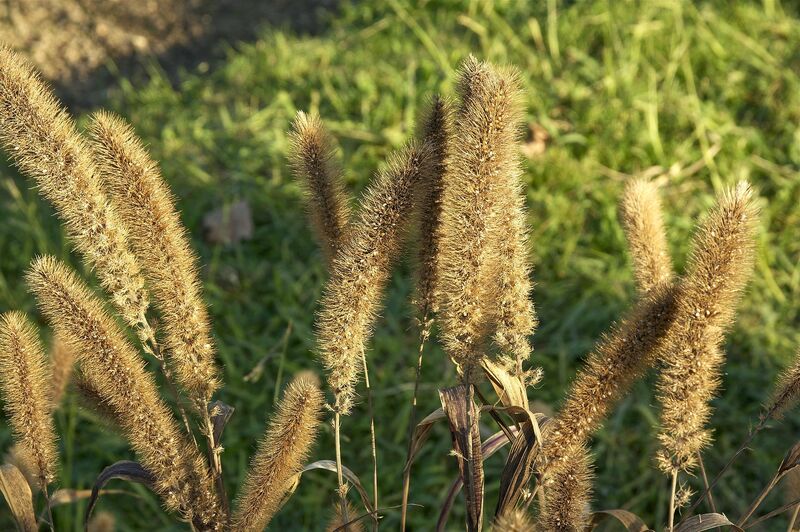 Millet was cheap to purchase and easy to grown alongside both summer and winter crops. Millet could have helped to hedge against famine in terms of its ability to grow in a wide range of less than ideal agricultural environments. This would have been a very important trait in an unpredictable agrarian world that was quickly exhausting its agricultural farmland (Fraser and Rimas 2010). As the ancient author Strabo (5.1.12) advised, ‘millet is the greatest preventive of famine, since it withstands every unfavourable weather, and can never fail, even though there be scarcity of every other grain’. Traditional Roman foods were considered ones that the small farmer could grow cheaply on their small plots of land to sustain their families which included millets, pulses and vegetables. Millets were grown in Europe since the Bronze Age and possessed a hardy nature, capable of growing when and where other crops failed. These intrinsic attributes of common and Italian millet’s nature tie-in with traditional Roman values, connecting Romans with their perceived past as a conservative, hardy agrarian people living off the land. Based upon limited ritual evidence, common and Italian millet were likely traditional Roman foods that continued to be offered to the gods. Hence, common and Italian millet appear to fit into the model of the conflicted Roman psyche of traditional agrarian values and the reality of expanding new frontiers and increasing influx of foreign foods and ideas within the empire. Thus, the evidence for millet reveals that millet was part of the Roman dietary assemblage, to varying degrees, throughout the Roman empire. Based upon the limited evidence to date it looks like millet consumption within Roman society was a more complex issue than the ancient sources alone would lead one to believe and millet consumption was closely tied to Roman social, economic and cultural values (Killgrove and Tykot 2013, p. 36). As more data is collected it is suspected that millets’ reputation and usefulness in the ancient world will become clearer and millets will move beyond being regarded simply as animal fodder. Murphy, C (2015) Finding Millet in the Roman world. Archaeological and Anthropological Sciences. DOI 10.1007/s12520-015-0237-4. Murphy, C (2011) Pompeii, A Changing City, the Archaeobotanical Analysis of Insula VI.I. Unpublished PhD thesis, Institute of Archaeology, UCL. This entry was posted in Agriculture and processing, Environmental archaeology, Ingredients, New Research and tagged common millet, italian millet, millet, Pompeii, Roman Empire, Roman Italy, Roman world on May 6, 2015 by lisalodwick. The Garamantes, a tribal group who occupied Fazzan, southern Libya from c900BC to AD500, held a strategically important position within a complex trade network linking sub-Saharan and east Africa with the Mediterranean and Nile valley. Through contact with diverse cultural groups they evolved agricultural, material, burial and building traditions which reflect both their desert origins and their trading links. 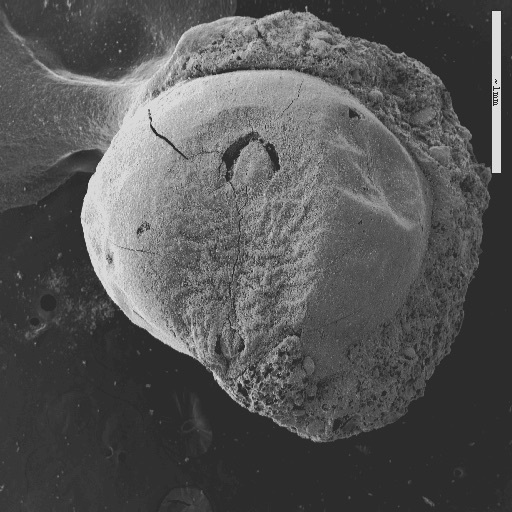 Plant remains and artefacts associated with food and consumption recovered during the Fazzan Project , particularly excavations at the ancient capital of Garama (Old Garma), led by David Mattingly of Leicester University, indicate that this ‘fusion’ culture can also be seen in the agricultue and diet of the population. Settled agricultural communities emerged in the first half of the 1st millennium BC, with a material culture evolved locally from the preceding late pastoral Neolithic period. The crops cultivated were more Mediterranean in character: emmer wheat, barley, and a small amount of bread type wheat, as well as the fruits grapes and figs. 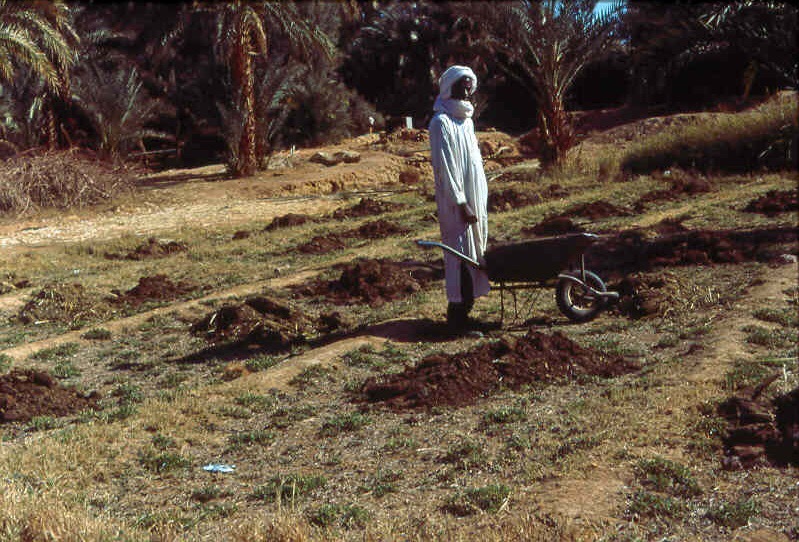 Dates, which are more suited to the desert oasis environment, were also cultivated, but may have been introduced to the region somewhat earlier (dates have been found in late pastoral Neolithic graves). Crops were probably grown in small garden plots, likely to have been regularly heaped with manure, perhaps with shade provided by the date palms, and irrigated by water, possible drawn from wells. Towards the end of the first millennium cultural and archaeobotanical evidence indicates a new wave of influences, contemporary with the emergence of complex trading societies both north and south of the Sahara (Greek and Phoenician settlements, the beginnings of the Kingdom of Ghana, and city state of Djenné-Djenno, and the Kushite/Meroitic Kingdoms). 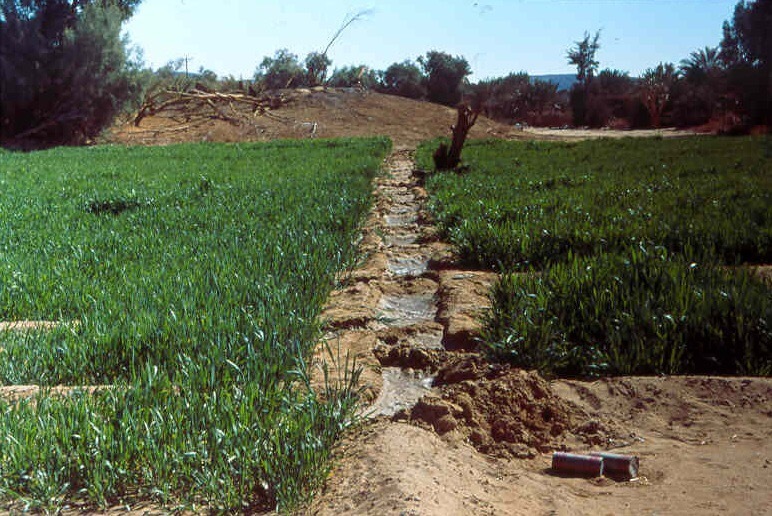 The introduction of a new irrigation technique, foggara, originating from Persia and introduced via the Egyptian Oases, must have revolutionised arable production. Foggara technology enabled an increase in the speed water was taken to the fields and the area of land irrigated, as well as enabling year round cultivation and the introduction of two significant summer crops from sub-Saharan Africa: sorghum and pearl millet. Sorghum arrived in Nubia (southern Egypt/northern Sudan) at a similar time but appears to have been a different type to that found in Garamantian Fazzan, and which eventually evolved into the durra type grown both in Nubia and Fazzan today. Slaves may have been used to construct and maintain the new irrigation system and it is possible that they brought crops and associated artefacts with them. New pottery types included flat doka, ceramic platters which are thought to be associated with making flat, pancake type bread, and in Sudan are assumed to be associated with sorghum. The doka disappear from the site of Garama in the Islamic period when bread ovens started to appear, suggesting a change in bread technology associated perhaps with new social influences. Quern stones were flat, saddle quern types, and are found on both settlement sites and within burials, suggesting a particular significance. Other cultural evidence for sub-Saharan contacts include a lip plug found in the grave of a young woman. From the Mediterranean region Punic beads and Punic/Hellenistic amphora have been found on settlement sites, indicating the import of consumable goods. Graves were marked by upright stone stele and offering tables, which may have contained food. Agriculture in Fazzan: adding manure to garden plots (top) and irrigating winter cereals (bottom). Copyright Ruth Pelling. SEM images of Pennisetum glaucum (pearl millet) (bottom) and Sorghum bicolour (sorghum) (top) from the site of Tinda B. Copyright Ruth Pelling. The 1st and 2nd centuries AD represent the high point of Garamantian society, coinciding with the maximum extent and wealth of the Roman Empire as well as the flourishing of sub-Saharan kingdoms. It is likely that the Garamantes grew wealthy due to their access to water and strategic geographical position at the centre of a complex trading network which took gold, salt, slaves and wild animals (and later cotton and rice) to the north, and consumable goods like oil and wine as well as ceramics, glassware and worked jewellery, to Fazzan, and maybe beyond. In this period large quantities of imported vessels appear in both grave assemblages and on settlement sites: amphorae, glassware, sigilata, oil lamps and more utilitarian ceramic coarse-wares. Rotary querns appear for the first time, initially imported basaltic lava examples, soon replaced by locally produced sandstone versions. Deep mortars also emerge, better suited to pounding millets and other small seeds, as well as non-food items. New food crops which appear include imported fruits such as pomegranate, almond and cucumber or melon (the seeds are difficult to distinguish if preservation is poor). A new wheat type, durum wheat, appears which is the variety associated with pasta and couscous. Fish bones of Mediterranean origin have even been recovered, perhaps imported with garum fish paste. Camel also appears at this time, while large deposits of seeds of wild, thorny shrubs only usually consumed by camels, suggest some tethering or stabling of the animals within the settlement. Ceramic fine-wares were mostly recovered from grave assemblages, often accompanied by quern stones (rotary and saddle querns), glass, amphorae, and oil lamps, perhaps related to the funerary rite. Stele and offering tables continue to mark the graves. In contrast the ceramics from within the settlement sites tend to be of more utilitarian imported coarse-ware as well as locally produced pots. New types of coarse-ware include casseroles and saucepans with lids. It is tempting to suggest a link with the introduction of durum wheat and perhaps a development of more sauce based couscous type dishes. Towards the end of the Garamantian period the population and the wealth of imported goods declined. The range of exotic imported fruits dwindled and sorghum disappears from the archaeobotanical record. Interestingly cotton, a crop first domesticated in the Indian sub-continent, but also possibly domesticated in sub-Saharan Africa, appears in the archaeobotanical record during the later phases of the Roman Empire, perhaps to fill demand for cotton cloth at a time when the decline in global trade networks reduced the availability of imported Indian cloth. The disappearance of sorghum could be related to the reduction in sorghum growing population, particularly if it was associated with sub-Saharan slaves. When sorghum was reintroduced in the post-medieval period it was the durra type, which may have evolved in Nubia, and which is today known by its variety name ‘durra’, suggesting both name and crop were late introductions. Unlike sub-Saharan Africa, sorghum is not today cultivated as a bread grain or beer, but is more commonly use as animal feed, or a snack food (as pop-corn) or occasionally mixed with barley flour to produce bazeen, a flour, salt and water paste, eaten with meat and gravy. This is typical of a late adoption of a crop or food type into a pre-existing culinary tradition, rather that its introduction as part of a new cuisine or with a migrating population. Mattingly, D. J., Daniels, C. M., Dore, J. N., Edwards, D. and Hawthorne, J. 2003. The Archaeology of Fazzān. Volume 1, Synthesis. The Society for Libyan Studies/Department of Antiquities, London. Mattingly, D. J., Daniels, C. M., Dore, J. N., Edwards, D. and Hawthorne, J. 2007. The Archaeology of Fazzān. Volume 2, Gazetteer, Pottery and Other Finds. The Society for Libyan Studies/Department of Antiquities, London. Mattingly, D. J., Daniels, C. M., Dore, J. N., Edwards, D. and Hawthorne, J. 2010. The Archaeology of Fazzān. Volume 3, Excavations of C.M. Daniels. The Society for Libyan Studies/Department of Antiquities, London. Mattingly, D. J., Daniels, C. M., Dore, J. N., Edwards, D. and Hawthorne, J. 2014. The Archaeology of Fazzān. 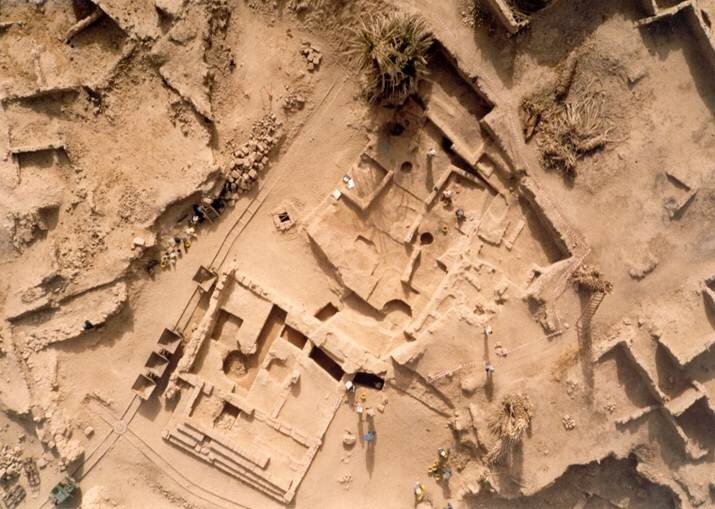 Volume 4, Survey and Excavations at Old Jarma (Ancient Garama) carried out by C. M. Daniels (1962–69) and the Fazzān Project (1997–2001). The Society for Libyan Studies/Department of Antiquities, London. 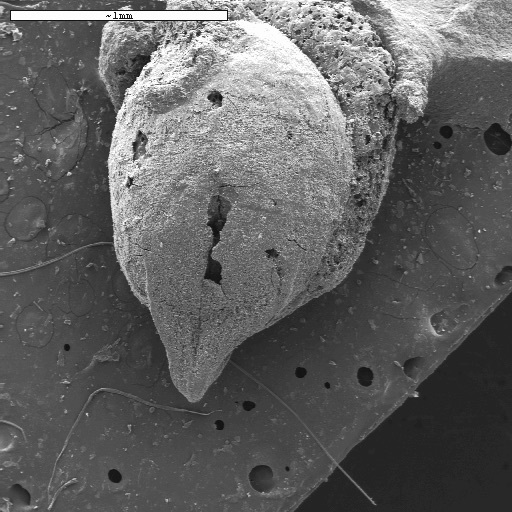 This entry was posted in Agriculture and processing, Environmental archaeology, New Research and tagged archaeobotany, Garamantes, Roman on May 1, 2015 by lisalodwick. One of the most iconic sights in Pompeii are the bakeries with their donkey mills. These hourglass-shaped mills were one of several types in use in the Roman world to mill grain ready to make bread. The donkey mills have a solid lower stone, called a meta, which was bell-shaped. Over the top was a hollow upper stone, which was shaped like an hour glass; this was called the catillus. The catillus functioned like a hopper into which the grain would be poured for grinding. The stone used is hard and abrasive to help with the grinding, often basalt. As their name suggests, these mills were probably rotated by donkeys. In addition to these extant examples, there are also numerous depictions on tombstones and sarcaophagi. These come not only from Italy, but also from North Africa, the Aegean and Gaul, which attests to how widespread they were in the Roman world. 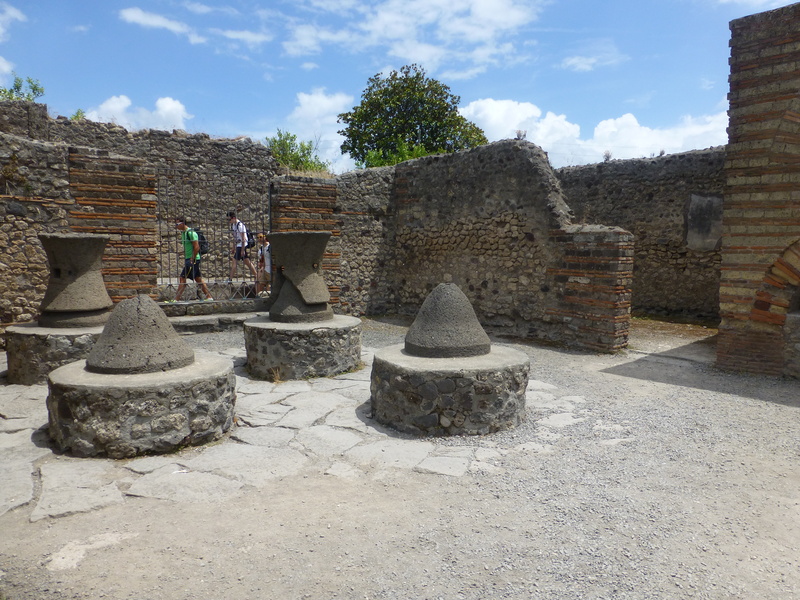 One of several bakeries in Pompeii where grain was milled on site using donkey mills. One of the objects we have selected for our exhibition comes from a different kind of mill: a rotary hand quern. These are also made from hard, abrasive stone to help grind the grain. Rotary querns are flatter than donkey mills, but also have an upper and lower stone. These kinds of mill would have ground smaller amounts of grain and would have been sufficient for a domestic household. At the other end of the scale are watermills, which could grind grain on an industrial scale. Studies of Roman watermills have suffered in the past from the traditional view of technological stagnation in the ancient world. It was thought that slave labour and lack of interest in investment in new technologies caused a lack of water milling technology. As a consequence, for a long time, all water mills were thought to date to the early medieval period at the earliest. This idea was challenged by Orjan Wikander in the 1980s, who started to find archaeological evidence for watermills belonging to the Roman period. There are two main types of watermill that are distinguished by the orientation of the wheel: vertical or horizontal. The vertical wheel requires a right-angle gear and turns a horizontal wheel shaft on the other end of which is a vertical cogwheel. This cogwheel drives a horizontal cogwheel and the millstones above. The horizontal wheel does not require a gearing system and is driven by water conducted either by a steep chute onto oblique paddles on the wheel or from a nozzle at the base of an arubah penstock (which functions like a tube delivering water to the wheel), or exceptionally, as a turbine. 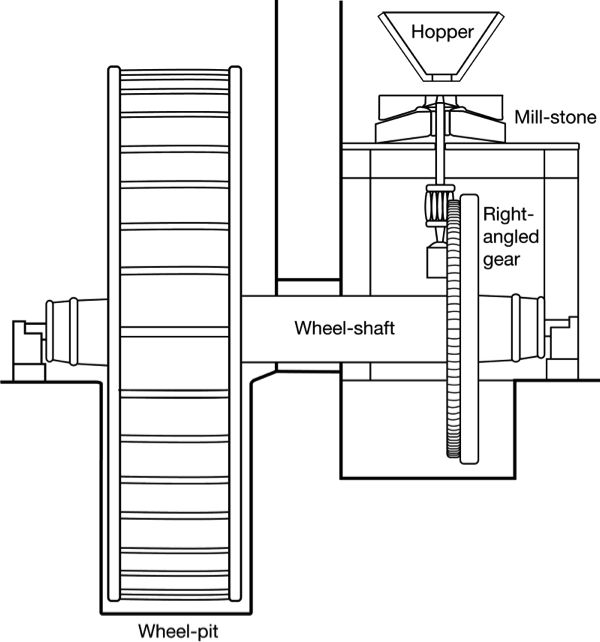 Schematic drawing of a vertical-wheeled mill with a right-angled gear. Schematic drawing of a horizontal-wheeled mill with an arubah penstock. In most parts of the Roman world, mills are of the vertical-wheeled type. In some cases, as at Barbegal in France, there were 16 wheels in a single installation. This multi-wheeled mills give a strong impression of the scale of grain milling that was occurring in the Roman world. They suggest that grain was being milled at a near-industrial scale and so that there was a large market for grain and bread. This market may have been related to the annona, a system of free grain (and later bread) given out to the populace – this is where the phrase ‘bread and circuses’ comes from i.e. that these were given to the people to keep them happy and peaceful. 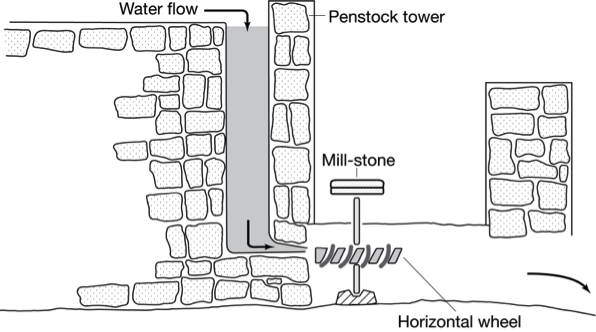 In the Near East, the majority of the 25 known watermills seem to be of the horizontal type with an arubah penstock. The arubah penstock is usually a 6-10 m high stone tower that contains a column of water. This column of water is let out through a narrow orifice at the bottom of the tower, so the wheel is driven by a jet of water under pressure. It seems that this type was used in the Near East because it is a particularly efficient design to use when there is a limited flow of water. Dating watermills is fraught with difficulty, so most of the Near Eastern mills I looked at in my PhD thesis were only tentatively dated to the Roman period. A case in point is the mill complex at Lejjun, which was thought for several years to date to the Roman period, but excavation subsequently revealed that it dates back only as far as the 19th-century AD Ottoman use of the area (McQuitty, A. “Watermills in Jordan: technology, typology, dating and development,” in Amr, K., Zayadine, F. and Zaghloul, M. (eds) Studies in the History and Archaeology of Jordan 5 (Amman: Dept of Antiquities, 1995), 745-751.). In some rare cases, the mills can be dated from literary references, for example the mills at Amida were mentioned by Ammianus Marcellinus (18.8.11) and so can be firmly dated to AD359. For a full account of grain mills and milling, in the ancient world, see LA Moritz 1958 Grain Mills and Flour in Classical Antiquity – old, but still good on donkey mills and rotary hand querns. This entry was posted in Agriculture and processing, Corinium Exhibition, New Research and tagged Amida, Ammianus Marcellinus, annona, Barbegal, bread, circuses, donkey mills, Lejjun, Near East, Pompeii, rotary hand querns, water mills, watermills on November 23, 2014 by zkamash2013. How do we know about Roman food?